1. Pre-heat your oven to 180 Deg C and line the base of a 20 cm cake tin. 3. Cut the apples into small chunks, removing the core as you go. Put them in a bowl with the juice of the lemon, cinnamon and Demerara sugar, toss well. 4. Add the eggs one at a time to the butter and sugar. Sift the flour and baking powder together and lightly fold them into the mixture. 5. 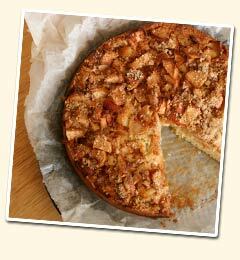 Scrape the batter into the lined cake tin and place the spiced apples on top. 6. Scatter the breadcrumbs on top followed by a little extra sugar. 7. Bake for 55 minutes to an hour. The edges should be brown and the middle nicely firm. Leave to cool for ten minutes while you make a pot of Friendship Tea. Eat while it’s still warm!